VANCOUVER, BC, January 18, 2011, Mirasol Resources Ltd. (TSX-V: MRZ, Frankfurt: M8R) is pleased to announce the results from an infill drilling at the La Negra silver-gold deposit at the Joaquin Project in Santa Cruz, Argentina and to present a new geological model for the La Negra deposit being explored by Mirasol’s joint venture partner Coeur d’Alene Mines (“Coeur”). 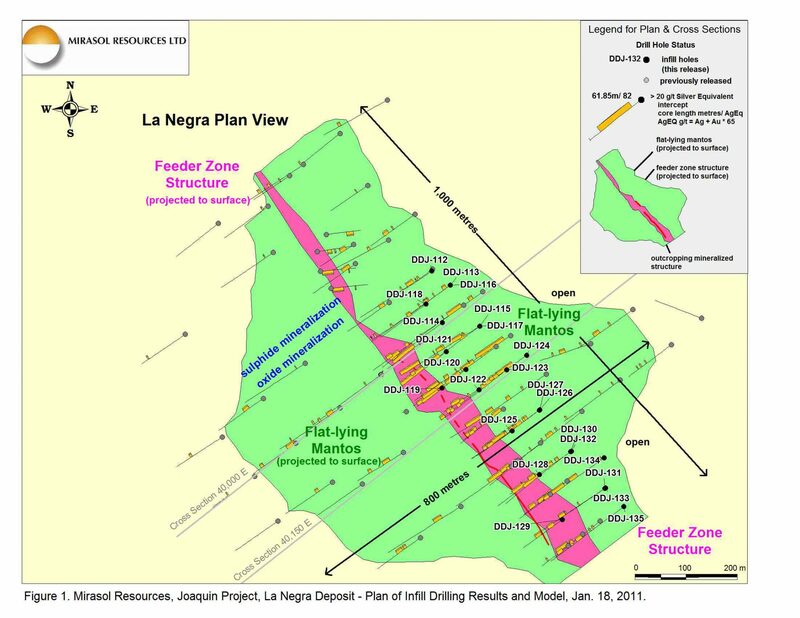 Infill drilling at La Negra was conducted on 50 metre spaced sections with approximately 50 metre spaced drill centers. This press release presents a summary of the infill drilling results (Table 1), with complete results available on Mirasol’s website (click here – Table 3a). Better intersections from the infill drilling include DDJ-115 with 67.0 metres of 94 g/t AgEQ (silver equivalent), DDJ-117 with 15.0 metres of 972 g/t AgEQ, and DDJ-132 with 13.6 metres of 1,454 AgEQ. These intersections correspond to what has been modeled (Figure 1 and Figure 2) as feeder zone and “manto” style mineralization proximal to the feeder. Additional indicative intersections from within the mantos include DDJ-123 of 61.85m with of 82 g/t AgEQ, and DDJ-124 containing 58.3 metres of 65 g/t AgEQ. The overall grade and thickness of the intercepts from the infill program appears similar to that of the previous drill holes. Modeling of the La Negra silver mineralization by Coeur suggests the possibility of a central, sub-vertical, structurally-controlled feeder zone with a series of stacked sub-horizontal “mantos” possibly controlled by lithologic contacts adjacent to the feeder structure. The plan projection of the mantos to surface is up to 800 metres wide, while the strike length of the feeder zone has been drilled over 1,000 metres. This new model, if proven to be correct by further drilling, may have significant positive implications for the volume of mineralization present. The modeling also shows that although the depth of oxidation is variable, the majority of the La Negra deposit is oxidized to between 200 and 250 metres below surface. This deep oxidation suggests potential for development of the oxide material via a bulk mining leach operation. Coeur is actively undertaking surface exploration at Joaquin in Q1 of 2011 on the approximately 80% of the Joaquin claims that remain underexplored. Coeur has commissioned an independent study which has identified multiple priority targets for exploration follow up. This program is expected to include drill testing of previously untested targets. In December 2010, Coeur, the Project operator, notified Mirasol that it has expended the necessary funds to earn a 51% interest in Joaquin. Coeur may elect to increase its interest to 61% by funding a 43-101 compliant feasibility study on Joaquin, and upon completion, may acquire a further 10% to reach 71% interest if project financing is provided at the request of Mirasol. The Joaquin project is located in the Area of Special Interest for Mining in Santa Cruz, Argentina where four precious metal mines are currently operating. Silver equivalent is calculated as AgEQ g/t = Ag g/t + 65 x Au g/t. Metallurgical recoveries are unknown and therefore assumed to be 100%. Primary intersections are calculated at a cutoff grade of 20 g/t (La Negra) silver equivalent (AgEQ) and 30 g/t (La Morocha) with some internal dilution allowed at the discretion of the project’s Qualified Person. Mirasol’s management is pleased with the infill drilling results at the La Negra silver-gold deposit, which confirm the potential for bulk-mineable mineralization at economic grades. Mirasol Resources is pleased to be evaluating this project with Coeur d’Alene, who brings to the joint venture significant experience in the exploration and development of epithermal precious metal mineralization in the region. 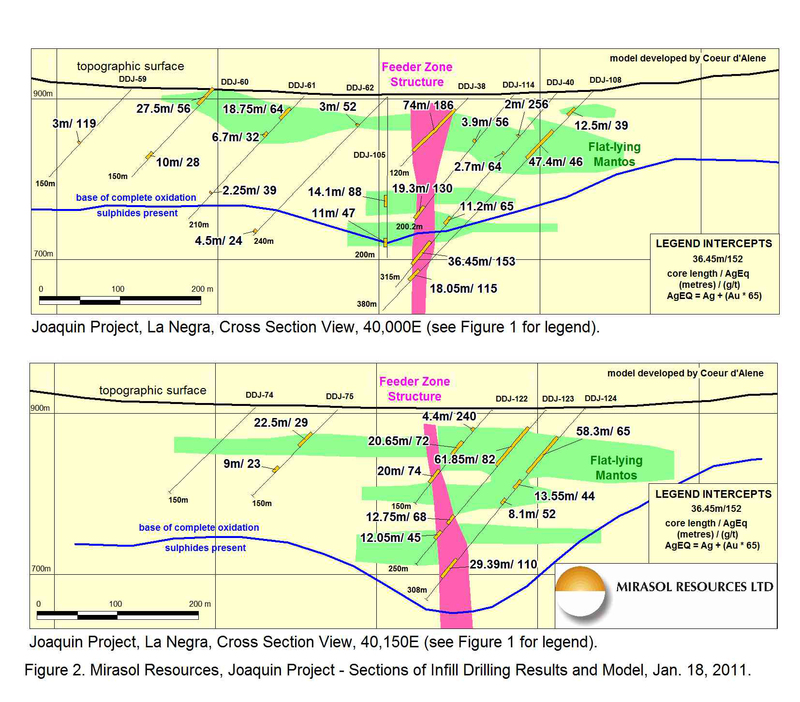 Coeur d’Alene operates the Joaquin Joint Venture and generated the drilling data used in this news release and reported it to Mirasol. Drill core samples were submitted to Alex Stewart (Assayers), Argentina S.A. and ALS Laboratories, both ISO 9000-2000 accredited laboratories located in Mendoza, Argentina. Gold and silver results were determined using standard fire assay techniques on a 50 gram sample with an atomic absorption finish for gold and a gravimetric finish for silver. Coeur’s QAQC program includes the insertion of blanks, standards and duplicates into the sample stream for Joaquin drill holes. Mirasol has performed an independent analysis of the QAQC data generated by Coeur. Dr. Paul Lhotka has reviewed the Coeur data, calculated the intercepts in this news release, and is a qualified person as defined by National Instrument 43-101.